Welcome to the "Better Botanical Business Bureau", where botanical mistakes in commercial and public venues and products are showcased and corrected. It is not unusual with products, ingredients, and images used in media, design, and commercial works to be presented with the wrong common names, wrong species names, and/or wrong ingredients. This blog provides scientific and educational information to correct such mistakes as part of a global effort to increase botanical knowledge. Screenshot from New Scientist website (link) by BotanicalAccuracy.com, 18 Aug 2016. Fair use. 'Close-Up of Moss on Rocks' photo (link), featuring a lichen, not a moss. Fair use. The bushy, light-colored lichens of the genus Cladonia shown above (also known as reindeer lichens and many other names) are seemingly perpetually misidentified and mislabeled as mosses, I have written about this elsewhere here on the blog. So how to avoid mistakes like this? It would be very helpful if stock photo companies demanded accurate descriptions of photos, and if media checked the images with the people that know, not the least the authors of the paper that is featured. 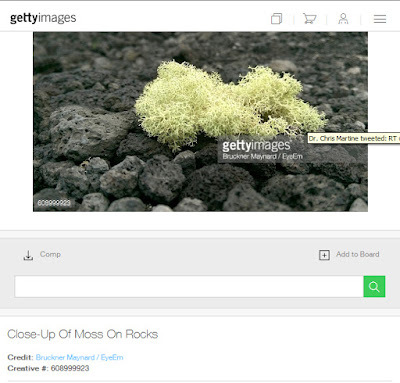 I can just imagine their frustration and possible horror to have their bryophyte story illustrated with a photo of a lichen, especially since there are so many gorgeous moss photos. PS. 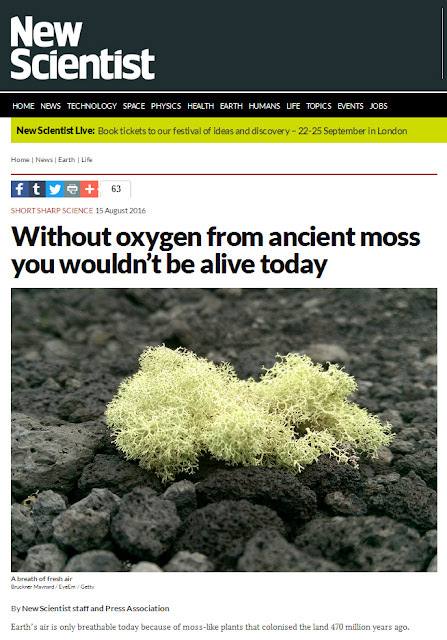 Thanks to TT who notified me of this mistake, which hopefully will be corrected by the New Scientist editors very soon. PS2. UPDATE: The photo is now corrected in the article in New Scientist. Would you care if someone called a cat 'a mouse' in the description of a medieval painting? Would you care if someone served you horse meat, but said it was beef? I bet you would. Would you care if the wrong chemical was listed in the ingredient list of your shampoo or cereal? Would you care if you bought one plant, but got another? Would you care if there were species or ingredient mistakes in advertising, menus, herbal pills, and such things? Would you care if books on plants are illustrated with the wrong plants? If so, here is the place for you to read about such problems in the world of plants and plant products, where unfortunately such mistakes, inaccuracies, and problems are not uncommon. This is usually due to lack of botanical knowledge or expertise, or sometimes because of plain ignorance. Inaccuracies are common when it comes to plants, because it seems like we humans care to learn less about green things like trees, flowers, and herbs than we care to learn about animals, even when we eat plants, paint them, plant them, extract their chemicals, or use them in numerous other ways. Without plants in the world you and I certainly would be dead. Some plants can also kill you with their toxins, so it is best to know which plant is what species. Time to learn some botany! Dr. Lena Struwe, botanist (New Jersey, USA). Science is a process of gaining knowledge and understanding of the world around us. It is a never-ending process, and what we think are true facts today might change tomorrow. In science we are aiming for having the best understanding possible today based on what we and our predecessors have learned until now. This means that what is botanically accurate from a scientific viewpoint might (and will) change. Other experts in the field of botany know a lot more about their particular research plants than I do. New scientific findings and conclusions are being published every day. This is just normal and part of the scientific process; we improve on our knowledge all the time. The important thing is our willingness to continuously aim for botanical accuracy and the highest scientific standards in our use of names and facts. When things are wrong, let's correct them. Let us not perpetuate wrong botanical knowledge by accepting its incorrect use on commercial products, in everyday language, or in other parts of our contemporary cultures. Through scientific education and specific corrections we will improve botany and science for everybody, in supermarkets, restaurants, and garden centers. It is the perpetuation of incorrect facts that are the problem, not the need for correction. Everybody makes mistakes, and everybody learns, throughout their lives. We need words to be able to communicate and talk about things, so let's use the right words and the right species names. Undoubtedly there will be mistakes and errors on this blog, or things that need to be updated. If you want to get in touch, please e-mail me at botanicalaccuracy at gmail.com. If you see a mistake on this blog, e-mail me with the link to the post and an explanation what is incorrect and should be updated. If you represent a company and want to get in touch, please use the same e-mail address. Celery - stems, stalks, or sticks? Kissing under the mistletoe, or is it holly? Gordolobo is or isn't mullein? Relevant keywords: quality, botany, fake, wrong, ingredient, content, chemical, botanicals, herbals, design, art, incorrect, control, nomenclature, species, plants, plant, flower, garden, museum, company, commercial, control, appropriate, right, correct, business, media, name, marketing. ABOUT THIS BLOG: Please note that posts will be updated when new information becomes available. 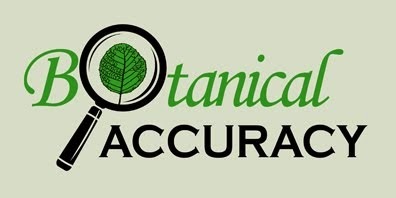 Updates on companies that have fixed their botanical accuracies are welcome, as are newly found inaccuracies. Images posted on this blog are either copyrighted but used here under the fair use exception (as part of criticism and review of products, educational, commentary, etc. ), copyrighted and used with specific permission, or have Creative Commons licenses or are available in the public domain. The mention of any product, company, or botanical ingredient and its use is not an endorsement of any kind. © 2014 onwards, Lena Struwe Botanical Accuracy. .·´¯`·.´¯`·.¸¸.·´¯`·.¸><(((º> . Awesome Inc. theme. Powered by Blogger.